What's a yoga/pilates/crossfit (etc.) body? A few years ago, Pop Pilates/Blogilates creator Cassey Ho made a video with all of the criticisms she has received as a pilates and fitness instructor. I'd like to take a small detour from music writing and general health things today to point out an interesting challenge I've noticed in the movement and wellness community. In addition to various "fitspiration" type messages on social media and advertising, there's an inaccurate notion that a certain physical activity will inevitably lead to a certain physical and aesthetic appearance, i.e., yoga and pilates practitioners are long and lean in appearance (please let me know what that is if you figure it out), crossfit and weight lifters are strong and muscular, and so forth. Couple that with some of the fitness slogans like "sweat is fat crying," and "don't stop until you're proud," and it can be difficult to know what to do. This standard makes it even more challenging when you're a teacher of those disciplines and you don't fit the "image" of what a teacher looks like. 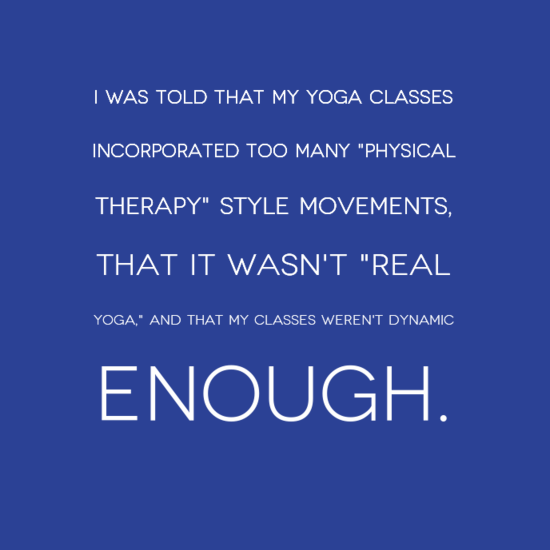 I love this campaign from the Yoga and Body Image Coalition. Here's the deal: every body responds differently to movement and diet. Period. Some people can eat junk food for years and be at a "healthy" weight, others might gain weight immediately with those eating habits. Some people do crossfit diligently and don't necessarily become lean or jacked (which is why I love the blog Fat Crossfitter) and some people will immediately change physique. Some pilates and yoga teachers are naturally tall and thin (or former dancers and gymnasts! ), others are not. In the world of fitness, there is this notion that there is a bottom line standard of lean and strong that we all can achieve if we only work hard enough, and if we don't have that body shape, then surely we must be doing something wrong, especially if we're a teacher. A pilates body must surely be a thin one, right? And a yoga body is a flexible thin one? And someone who lifts weights must be strong and chiseled? 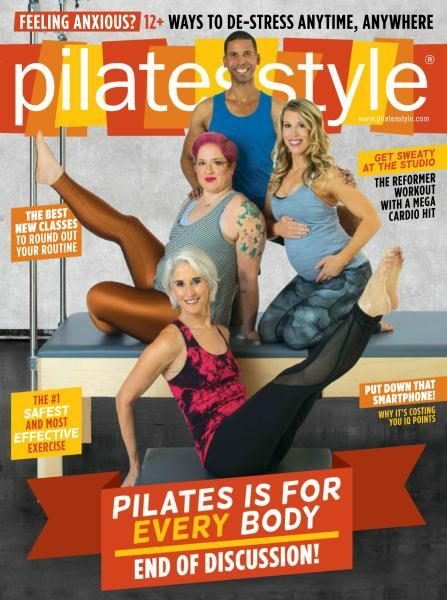 I loved this fall issue of Pilates Style but was crushed to hear that Anula Maiberg was body shamed on the internet for her appearance in her article. Take a class with her, and you'll see that she's smart and well informed, and more importantly, the classes are hard! We all have anthropomorphic differences that affect the way our bodies process exercise and diet, as well as hormonal, metabolic, and genetic differences, just as we have infinite variations of skin tone and hair color/texture. Give a group of people the same workout plan and diet, and everyone's body will change (or not change!) differently and at different rates. With a group of female fitness professionals between 30-50, you may have women with hypothyroidism or PCOS, women who have delivered multiple babies, women who may have chronic fatigue, women who have never been petite, and women who are happy and healthy at a different size than you. And as a student or fellow teacher, you may judge a person for their body, but you don't know what's going on for them. (These folks are also business owners trying to make it work, independent contractors running around to teach, mothers, fathers, caregivers, partners, and more.) For some reason, this seems to be ignored in regards to fitness teaching-and it's preposterous. In her awesome podcast, Pilates Unfiltered, Chicago based instructor Jenna Zaffino mentioned this very issue last fall. Why don't we look at movement as something more than a means of creating an aesthetic appearance? What about how someone feels in their body? Or improving their quality of movement? So many of us have illnesses that affect our body, whether larger ones that affect our energy, immunity, digestion, or hormones, or smaller injuries. Everyone has a different story, and not everyone should or can look the same, or achieve that "perfect lean" body aesthetic (especially if they've experienced body challenges). Side note, everyone’s definition of bodily perfection is different, which doesn’t help! In addition, the training, meal management and dedication needed for figure competitions and athletic modeling is often intense and not sustainable long term for most people. On the podcast "Behind the Podium," last fall, my friend and business owner Isabelle Barter said it best; "I am a movement educator. Some people are movement educators, some people are fitness models, some are both. But I am a movement educator." As a teacher and professional musician, I've absolutely been judged for my appearance and body composition- 25 years of playing viola means that I've spent a lot of time sitting in orchestras and ensembles (when I could've been exercising), coupled with some peculiar spine and shoulder challenges from adaptation. (Oh, and I'm not a size 2, can’t do all the crazy yoga poses or advanced Pilates work, and that’s ok!). That's part of my body story, and everyone has their own story. Judge me for my teaching and my knowledge, not my bodily appearance, especially not in regards to my movement ability. In the fitness community, it can be tempting to assume that a teacher without a perfect body doesn't know what they're doing, but odds are, they're highly trained, extremely busy, and don't have the time or desire to work out for hours a day to achieve a perfect physique. That doesn't mean that someone with a perfect body isn't worth studying with either, it just means that there is diversity of bodies within the greater movement community. "The body that moves you throughout your life without pain and with joy" is the one you want to inhabit, not necessarily the one the magazines and media want you to.